Hurricane Harvey, now weakened to a tropical depression, has caused widespread devastation along the Texas coast, including record rainfall and flooding comparable to 2005's Hurricane Katrina. Relief efforts will be costly and take years, authorities say. As residents of Corpus Christi and Rockport begin recovering from the hurricane's first landfall, communities of Port Arthur and Beaumont on the border of Louisiana are flooding as the storm returns from a detour in the Gulf of Mexico. Since Hurricane Harvey hit the coast of Texas on Friday, August 25, the Harris County Institute of Forensic Sciences has confirmed a total of 28 deaths in Harris County, which is home to the city of Houston. According to the Associated Press, a total of 42 people lost their lives as a result of the storm. The number is expected to climb as recovery efforts continue. Hurricane Harvey, which has been called a once-in-a-thousand-year-storm, devastated over 100,000 homes. 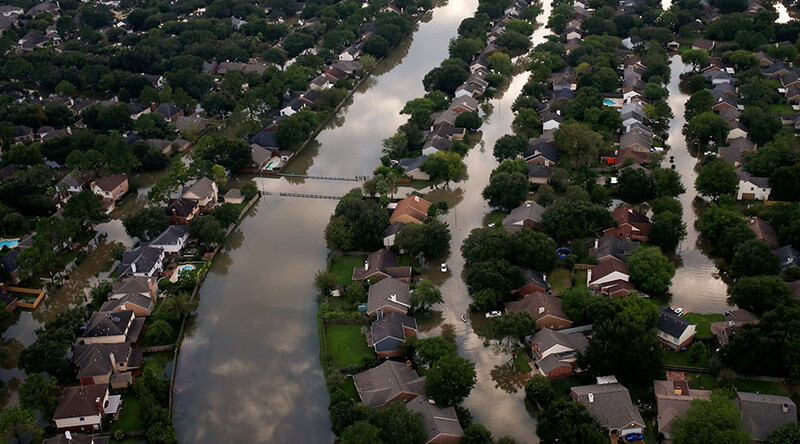 It is estimated that 1,300 square miles of Harris County was covered in one-and-a-half feet of water. The National Weather Service said that Harvey broke records, with up to 51.88 inches of rain recorded in some areas of Texas. Flooding caused explosions at a chemical plant near Houston and 439,000 Texans were forced to leave their homes and spend at least one night in one of the 258 shelters operating across the state and in Louisiana. Texas Governor Greg Abbott said that the recovery will take years and more than $100 billion dollars. So far, charities saw record donations for the victims, with Houston Texans defensive end JJ Watt raising more than $16 million as of Friday, shattering the record for donations to a crowdfunding campaign. Even President Donald Trump said he would pledge $1 million of his own personal money towards relief efforts for Hurricane Harvey. A local hero has emerged from the devastation caused by Hurricane Harvey. Through his press conferences and on his Twitter account, Jeff Lindner, a meteorologist with the Harris County Flood Control District, has provided victims with the latest news on evacuations, answered questions about rising water levels, and kept residents informed with constant updates throughout Hurricane Harvey. When Blake told Linder about the page, he said he was “blown away” by all the donations. However, Lindner said that he would not be allowed to accept any gifts over $100 as a government employee. Instead, Blake has decided to turn the campaign into a charity in Lindner’s name. So far, the campaign has raised more than $15,000, which will go to help the victims of Harvey. The fire erupted after two refrigerated trailers containing chemicals became too hot and combusted, Richard Rennard, president of acrylic monomers business for Arkema, said in a press conference. President Donald Trump has sent an initial request for $7.9 billion to fund recovery efforts related to Tropical Storm Harvey, the Associated Press reported Friday. White House budget director Mick Mulvaney requested the funds on behalf of the administration in a letter to Speaker of the House Paul Ryan (R-Wisconsin) obtained by NBC News. The House majority leader's office has listed the disaster funding bill as an item up for vote late next week, according to KRCR. Exxon Mobil engineers are working to restore the water supply to the city of Beaumont, Texas, where Harvey’s flood waters knocked out the town’s pumps. Ashley Alemayehu, a spokeswoman for Exxon, said that the company is working with two other companies to install a temporary pump that would provide water to residents, according to the Beaumont Enterprise. However, Alemayehu said that the water would still need to pass through a treatment facility before it can become operational. After a second trailer at the Arkema chemical plant in Crosby, Texas erupted in plumes of black smoke, the Environmental Protection Agency (EPA) and the Texas Commission on Environmental Quality (TCEQ) released a joint statement that said they are monitoring the smoke and air quality and the potential for additional fires in the area. They also said there are “aerial assets ready to be deployed” in the area if needed. Texas Authorities have received 1,992 complaints about price gouging and fraud, Jennifer Speller, a spokeswoman for Texas Attorney General Ken Paxton, told Reuters. Many of the complaints were about gas stations overcharging and necessities such as food, water and shelter. Speller said that price gouging is illegal if a disaster has been declared. Paxton also warned individuals who wish to help the victims of Hurricane Harvey by donating to charities to avoid fake charities and scams. In a news release issued Friday, Paxton advised donors to research the charity by using Charity Navigator or resources provided by the Office of the Texas Attorney General. He also warned against charities that demand immediate donations or those that refuse to provide detailed information about how the donations will be used. Houston Mayor Sylvester Turner called for the voluntary evacuations for residents of western portions of the city, due to flooding that could occur as a result of controlled water releases from the Addicks-Barker Reservoirs. Turner warned residents who chose not to evacuate that “a threat to life and property exists or is likely to exist in the immediate future.” He added that resident who chose to stay should be prepared to remain without electricity for the nest 10 to 15 days. CenterPoint Energy will be conducting targeted outages in the evacuation zone starting Friday afternoon. “The only recourse is to let the eight containers burn out," Rowe said, according to ABC News. "It’s 500,000 pounds of material; let that material burn out." On Saturday, President Trump will visit Houston, Texas and Lake Charles, Louisiana to meet with survivors of Hurricane Harvey and the flooding caused by the storm, the White House has confirmed.